During the weekend of Jan. 25th-27th the greater S.F. Bay Area had its heaviest rainfall in about two years. Where I am in Santa Cruz, on Monterey Bay, the climate remained wet and cloudy for over a week, clearing up beautifully by Wed., Feb. 6th. On that morning, when I left the house, a single, bright-white contrail lay prominently across the clear, blue sky overhead. As I drove the fifteen minutes or so down into Santa Cruz, I noticed more straight, white contrails that were spreading out in wispy cloud formations, as well as the planes that were laying fresh trails. In fact, as I peered around I could see evidence of previous contrails where fresh ones were being laid, along the exact same headings and roughly the same altitude. There is no shortage of reports on this aerial phenomenon, they begin in 1997 and continue to this day (as I am doing). A history of articles on the subject, a “bibliography” of sorts, can be found at http://educate-yourself.org/ct/#intro. A Google search of [chemtrails] yields 937,000 hits; [powder contrails] yields 22,800 hits, most of which probably refer to the 1975 U.S. Navy patent referenced above; a GoogleVideo search of [chemtrails] yields 4,387 hits ranging from 1 minute to nearly two hours; the evidence is overwhelming. When I undertook to determine the range of chemtrail reportings world-wide, I found that every single country on the globe (I physically used a globe) has chemtrail sightings/reports, even the Marshall Islands out in the middle of the Pacific! Try it yourself: just Google [chemtrails (any country )] and you will find an average of 2,000-3,000 hits. Apparently “again” means it has happened before – the law has since been repealed: U.S. CODE, TITLE 50 – WAR AND NATIONAL DEFENSE, CHAPTER 32 – CHEMICAL AND BIOLOGICAL WARFARE PROGRAM, SECTION 1520: “The use of human subjects will be allowed for the testing of chemical and biological agents by the U.S. Department of Defense, accounting to Congressional committees with respect to the experiments and studies.” [also referred to as PUBLIC LAW 95-79] The question of the validity of this info. in-and-of-itself should serve as the impetus to look further into the available resources, and where we suffer a lack of information, hypothetical reasoning dictates that we form postulates in order to compare them to our first-hand experience. 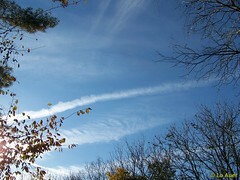 For example, there’s some speculation that “Morgellon’s Disease” is in some way associated with the “chemtrail” phenomenon. If we allow ourselves to speculate, we might ask “What is Morgellon’s Disease and are there any connections between the two?” The following is an article from The San Jose Mercury printed in Jan. 2008: http://www.mercurynews.com/healthandscience/ci_7995426 stating that “patients also complain of fatigue, joint pain, hair loss, vision problems and difficulty in thinking clearly.” Would heavy metal toxicity do these things? Is there a connection? Apparently the S.F. Bay Area has the highest occurrence of Morgellon’s AND a relentless campaign of aerial aerosol bombardment (the latter I can attest). In conclusion: I don’t even know how to handle this “ball,” let alone run with it; there are suddenly vast expanses of technology and mind-boggling forces at play, here, which would require a great deal more time than I can devote (”word” to all the investigative journalists out there!) I am prepared to have this work denigrated, marginalized and/or ignored, but the fact remains that it has arisen, for me, out of a need-to-know basis. My hope is that it will open the eyes of people everywhere who are concerned about health, environment, ever-increasing gov’t secrecy, and public awareness in general. Let me finish with an experiment – set up two sources of light in your home, one incandescent and one fluorescent. During daylight hours, or even as the day progresses, open all the blinds or curtains and compare the daylight to each of the two sources of light. Is your “ordinary daylight” coming to resemble the blue/white fluorescence more than the yellow/white incandescent? Or is it just hazy? I say that only today I picked out the faintest impression of blue/white streaks in the sky, a vaguely perceptible haze of straight white lines, and I’m pretty certain I’ve been hearing that incandescent bulbs are soon to be “out of production” in favor of the more expensive, incredibly more toxic fluorescent bulbs. Weird.